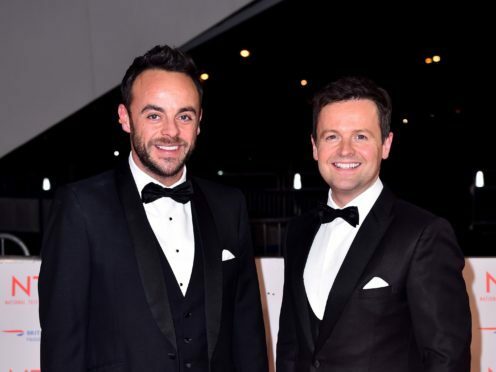 Ant & Dec’s Saturday Night Takeaway has won the coveted best entertainment show prize at the TV Choice Awards. Other winners include Strictly Come Dancing, which waltzed off with the best talent show prize. It beat shows including Britain’s Got Talent, Dancing On Ice and The Great British Bake Off to the accolade. In the soap categories, Coronation Street scooped the sought after best soap prize after a year of big storylines, including the Pat Phelan murders. Emmerdale took home two gongs – Ned Porteous was named best newcomer while fellow cast member Emma Atkins clinched best actress. Gangland drama Peaky Blinders was also a double winner at the glitzy event in London, which was hosted by Richard Osman. The show triumphed in the best drama and best actor (Cillian Murphy) categories. Best actress went to Michelle Keegan for her military drama Our Girl. Benidorm’s victory in the best comedy category was particularly sweet, as the series is bowing out after 10 series. The awards were held at The Dorchester on Park Lane, London.